The WeChat messenger application can perform a lot of useful functions. However, over time, it can accumulate a lot of needless files which will consume memory space, and result in an eventual slowing down of iPhone. It is therefore important to have a way of easily deleting unneeded files and folders from iPhone/iPad, to boost its performance. There are several Wechat Cleaners for iPhone that are available, which remove superfluous and junk files from the phone thereby freeing precious memory space. Erase iPhone messages, call history, Safari history, photos, videos, notes etc. The software has both free and paid options, and there is good customer support available for users of the software. This WeChat cleaner that can be used to clean out memory space on the iPhone. 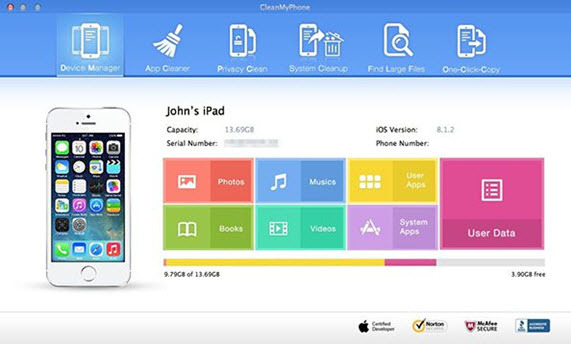 Some of the features of clean myphone include a simple and easily navigable interface, and support for all IOS devices. 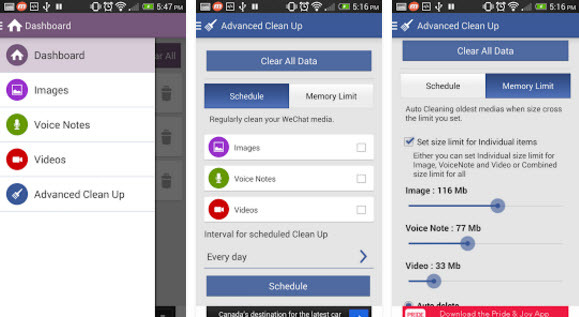 It offers app cleaner, system clean up, and privacy clean up options. It also offers back up with one click. This is another WeChat cleaner software. It has a beautiful display, and can show a thumbnail view of contents. It can also give statistics on the space occupied for each data type. It can be used to clear all unnecessary files that are not needed. It allows a detailed preview of the WeChat files available for deletion, through the scan option, so that the files available for deletion can be checked. It performs a highly selective deletion of WeChat files, messages, attachments, graphics, etc. It can erase WeChat fragments such as cookies, corrupted files, app caches, private file fragments. 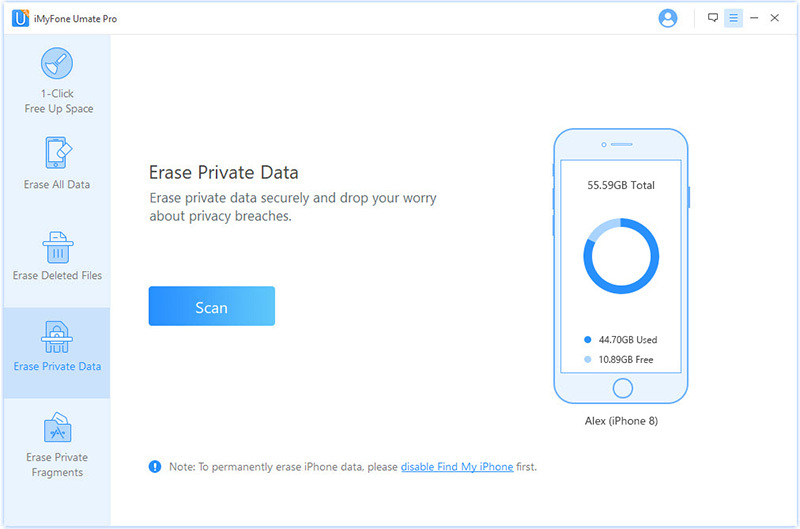 The software can also permanently erase selected WeChat files from the iPhone, so that such files become completely unrecoverable, even by the most sophisticated means. Previously deleted data may still be accessible through the right means. This can raise privacy concerns. WeChat has been associated with the Xcode ghost malware, which raises the possibility of security breaches. Step 1:First launch the Umate Pro software on the computer, and then connect the iPhone to the computer by USB. Step 2:On the menu bar by the left side of the software interface, choose “Erase Private Data”. Step 3:Then click on the scan button. 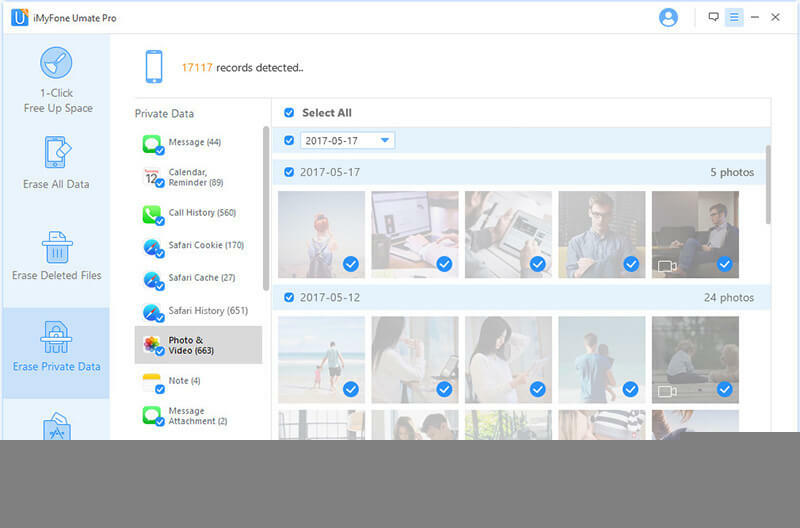 The Umate Pro software will now perform a scan of the phone, and bring up a list of private data files for possible deletion. Step 4:From the submenu on to the immediate right, choose the WeChat data that you want to delete. Step 5:Click on “Erase now” button. The Umate Pro will now erase the WeChat data from iPhone.